Have you ever thought of having a large backyard movie screen rentals in Springfield MA? Adults love to rent them for weddings so they can do slide shows in the evening. Adults also love watching their favorite sporting event such as Monday night football or Red Sox game. Many people will rent movie screens for their kids birthday parties during the months of April through October. We get great feedback from everyone that rents our movie screens. 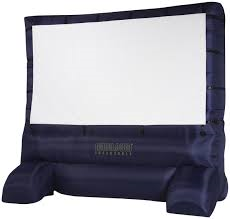 There are many different ways the large inflatable movie screen can be used. They can be used to hook up a DVD player to watch anything you would like. You could also hook up your cable box directly to the projector we provide *(as long as you have the proper wires). Kids in Springfield MA enjoy hooking up there xbox, playstation or wii system and playing on the Big screen with life size characters. Movie Screen Rentals are a fun addition to any party. Watch your favorite movie on the huge inflatable screen. Or watch your favorite sports team, or let the kids hook up their video game system and play their favorite game. The Movie Screen Rental comes with speakers and a high definition projector. You just provide whatever you are hooking up to it, DVD player, Laptop, Video Game system etc as well as the cables for hook up, (HDMI, VGA or audio video).Movie Screen Rentals are similar to a drive in movie theater so they must be used at night. Make your movie night complete with renting our popcorn machine and enjoy freshly popped popcorn with your movie!